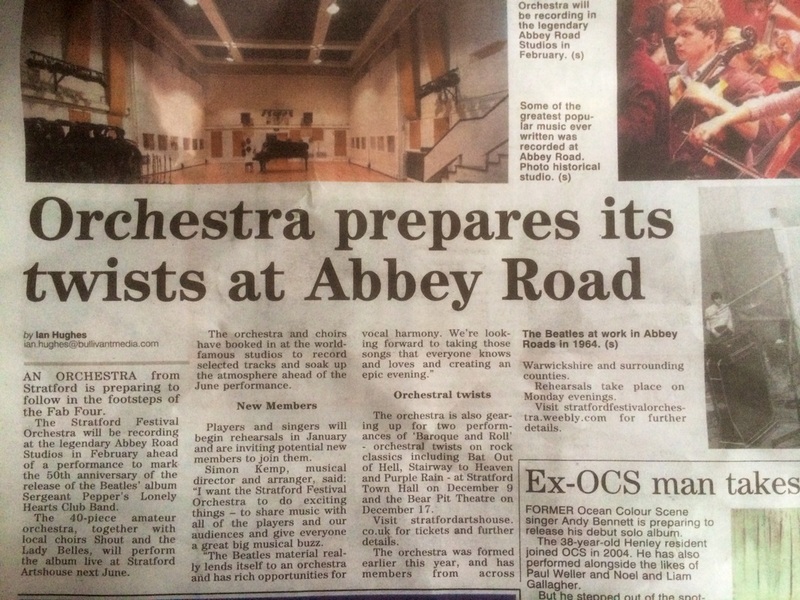 AN ORCHESTRA from Stratford is preparing to follow in the footsteps of the Fab Four. to mark the 50th anniversary of the release of the Beatles’ album Sergeant Pepper’s Lonely Hearts Club Band. 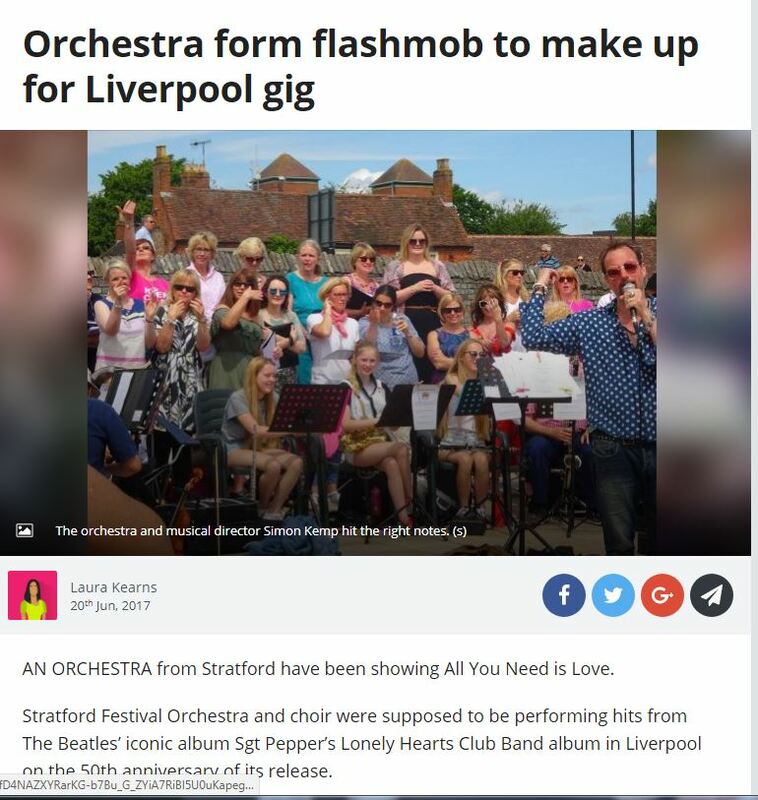 The 40-piece amateur orchestra, together with local choirs Shout and the Lady Belles, will perform the album live at Stratford Artshouse next June. The orchestra and choirs have booked in at the world-famous studios to record selected tracks and soak up the atmosphere ahead of the June performance. Players and singers will begin rehearsals in January and are inviting potential new members to join them. Simon Kemp, musical director and arranger, said: “I want the Stratford Festival Orchestra to do exciting things – to share music with all of the players and our audiences and give everyone a great big musical buzz. The orchestra is also gearing up for two performances of ‘Baroque and Roll’ – orchestral twists on rock classics including Bat Out of Hell, Stairway to Heaven and Purple Rain – at Stratford Town Hall on December 9 and the Bear Pit Theatre on December 17. Visit stratfordartshouse.co.uk for tickets and further details. The orchestra was formed earlier this year, and has members from across Warwickshire and surrounding counties. Rehearsals take place on Monday evenings. Visit stratfordfestivalorchestra.weebly.com for furtehr details. A NEW orchestra is looking for members to help hit all the right notes. Stratford Festival Orchestra tries to make music fun by playing whatever they like – from David Bowie and Led Zeppelin to musicals and some classical. And now they are looking for new members to join ahead of shows and projects in December and early next year. So far they have held several performances which have all sold out. A spokeswoman said: “We want players of all ages and abilities, particularly those who play strings or brass. “We don’t set out to be an overly serious symphony orchestra. We play anything from some rock to a touch of Bach. “But if you are only into heavy classical music we are probably not for you. “We particularly want to tempt back to music those who used to play some time ago but have lost the reason to get back into it. The orchestra practice every Monday night at 7pm in Stratford. 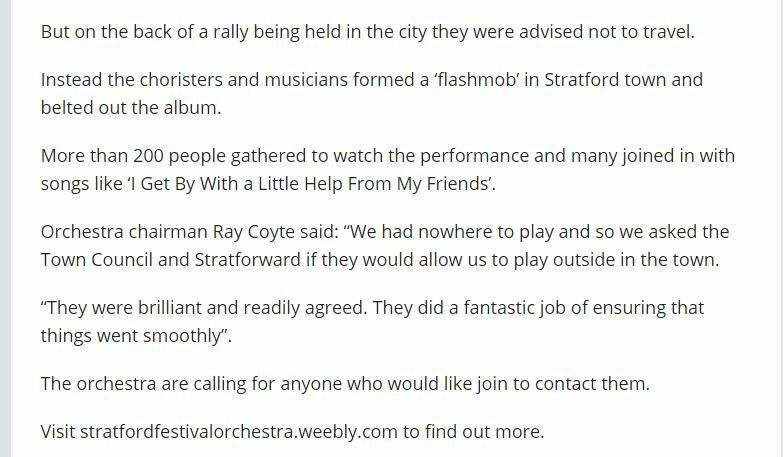 Email www.stratfordfestivalorchestra.weebly.com to find out more.